Over the past week U.S. residential real estate data has come in disappointing across the board. The immediate response to the slowdown from the mainstream media has been to disregard the data due to the weather conditions. A closer look at the regional data shows that the western portion of the U.S. (which was not impacted by the weather) has been just as troublesome as the remainder of the country. Existing home sales fell 5.1% month over month to the lowest reading in 18 months. The west experienced the greatest decline, while the northeast (weather?) fell the least. Single family home starts fell 16% in January, while multifamily starts fell 16.3%. Starts can certainly be impacted by the weather, but the starts in the west fell by 17%. 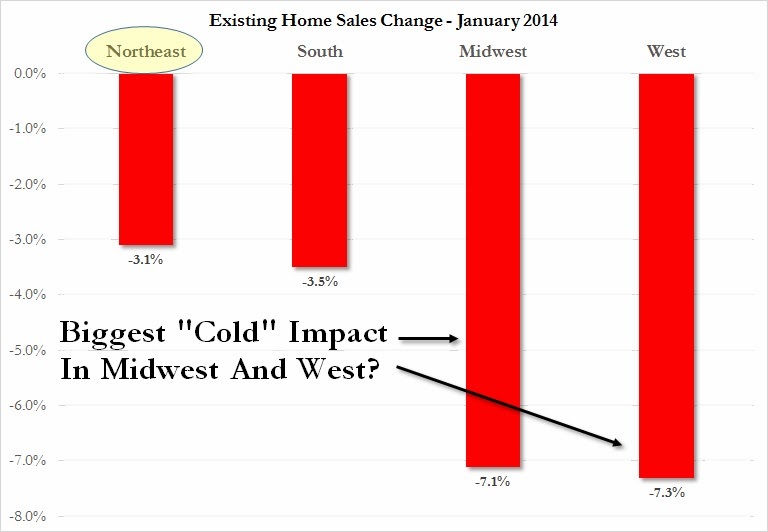 Housing permits, not weather related, fell by 5.1% (26% in the west). Home builder sentiment, which has been rising violently over the last two years, fell off a cliff in the most recent reading. The drop from 56 to 46 was the largest month over month decline in history. The largest sentiment decline occurred in the west. 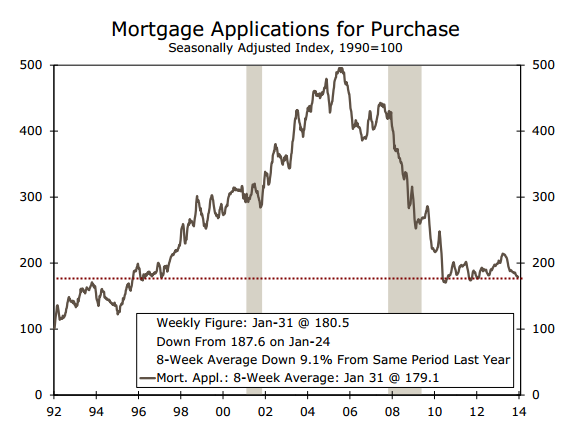 Mortgage applications have fallen 16% over the last five weeks and are now sitting at 1995 levels. While the stock market moves like a speed boat, the housing market makes turns like a cruise ship in the ocean. Prices have a tremendous amount of upward momentum so it takes longer for these early data points to become full turns. However, the view from the captain's seat on the cruise liner looks ominous. First time home buyers, the fuel needed for housing's hand off from speculators and Wall Street back to the public, have stepped away from the market. 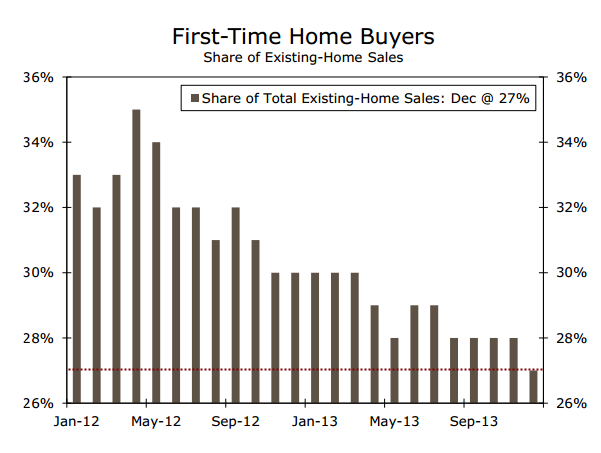 They have fallen from 35% of the market share in early 2012 down to 26% as of the most recent reading. Why? Home are much more expensive than they were two years ago. Less first time home buyers can afford to purchase at the median home price in major cities as they are entering the market with crushing student loan debt and declining real wages. A good friend of mine recently moved to San Francisco with his wonderful wife. They both have very high paying technology jobs but have not purchased a home. The reason? The price on a mediocre median priced home just crossed $1 million. The same theme has occurred in major cities throughout California, which is why the data from the west discussed above has been devastating. 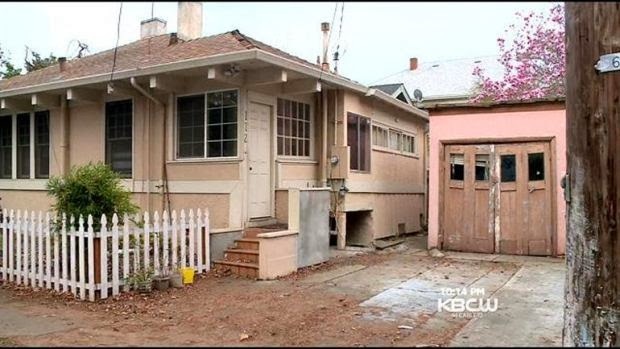 The following home, close to train tracks with a cracked foundation, recently sold for $1.6 million in Palo Alto. At some point, just we saw in 2006, the cost of a home for the next marginal buyer exceeds their ability to pay. This does not even factor in what should occur if interest rates were to rise or the economy were to slow down (both of these are coming). The major catalyst behind the most recent home price bounce has been Wall Street's entry into the market. However, home price appreciation impacts institutional money the same way. Jonathan Gray, Blackstone's global head of real estate said recently, "the challenge for us is as the prices go up the yields go down. So we have been winding down, not ending, but reducing the amount we are investing." Bloomberg reports that the rents used on the collateral for rental home securities declined by 7.6 percent from October to January. We are entering a phase where the cost for Wall Street to purchase homes is rising while rents are beginning decline. The largest portion of the acquisitions are well behind us, and the slow down in purchases may soon become net sales. We will continue to track the data here closely, as the most recent housing miracle and boost to GDP growth could soon become a drain.